Slice the citrus fruit thickly, about 1/2 inch. Remove the peel with a small serrated knife or kitchen shears. Remove any seeds. 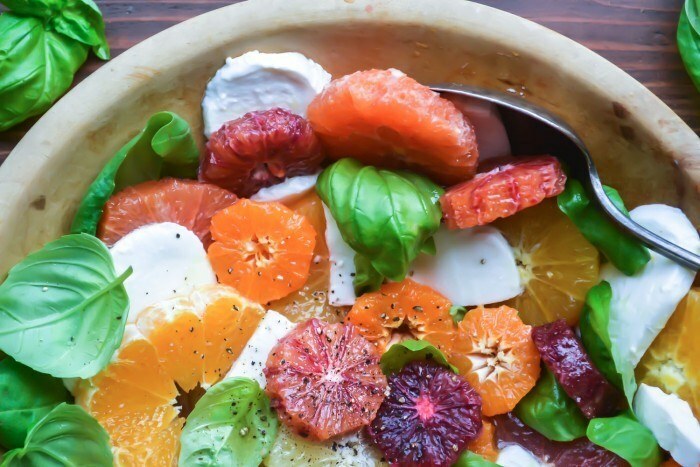 Layer the fruit on individual plates or in a serving bowl or platter, alternating with the sliced cheese and basil leaves. Sprinkle everything with some salt and pepper, then drizzle with the dressing. Serve immediately. To make the dressing just shake or whisk the ingredients together. Taste to adjust.